This morning we received the following comment summarizing last night's board meeting (11/24/14). The community member suggested we post it as a free standing post, after thanking us for all of our hard work in trying to bring transparency back to D181. We too listened to last night's meeting and agree with everything the author has written, so we are posting it as a free standing post. We will add a few additional comments at the end of the post. We are thankful for all of our readers' involvement in submitting comments and posts. It has made our job a little easier, especially this week. This will be our last post for this week. We will be taking a brief hiatus in order that we can enjoy this Thanksgiving holiday with friends and family. We will resume next week with "Daily Reason #8 Why Marty Turek Should NOT be Re-elected to the D181 BOE." "Ms. Garg ran the BOE meeting last night. She did a much better job than Turek. For the first time, actual issues were discussed in a meaningful manner and no one was rudely cut off. There was a real productive discussion. Clearly, Ms. Garg should be the next BOE president. Why does Turek feel the need to stunt real discussion and blindly pat the administration on the back? Ms. Garg showed last night that you can have meaningful conversation that is respectful and still run an efficient meeting. Dr. White: I appreciate you posting the science ISAT scores on board docs. I enjoyed the format of the science ISAT scores and urge you to present data in that format going forward. It was easy to understand and to digest. 1. The new way the administration is reporting MAP growth - using standard deviation - is disingenuous at best and it must stop. Even with the new 75% standard, it reports more kids meeting growth than the old 55% percent standard with no standard deviation. 2. We need an assessment director with a PHD in statistics who can crunch the numbers and also provide meaningful analysis on trends, areas of growth and problem areas. Data also needs to be presented in a short easy to digest format. 3. The compensation committee has yet to meet. They need to start their work quickly. Teacher salaries are growing faster than CPI. We will have a levy problem each year if we do not get a handle on this - levying to CPI will always produce a budget shortfall because teacher salaries are growing faster than CPI. We need to get a handle on this. We also need to be transparent about the actual cost of teacher salaries. 4. In times of tight budgets, all administrators need to be providing maximum value. Schneider and Benaitis added little value last night and White prepared the entire presentation himself. The one time Benaitis was called on to speak, she misspoke and later had to correct herself. 5. If a facilitator is brought on to reevaluate learning for all - and I think one should be - that facilitator must be a neutral third party with absolutely no ties to inclusion and social justice. I also think we should look to what Western Springs is doing. They far surpassed us in the recent rankings, and they have a much smaller operating budget. 6. The school improvement plans were discussed but no principals were present due to conferences. Next year there should not be a boe meeting during Thanksgiving break and these plans should be presented earlier in the year. Although the plans had much more substance than in years past, I was troubled by the lack of consistency in the district. For example, Madison is concentrating on flexible groupings, whereas Monroe is focusing on the workshop model. We are one district and we need to get this under control. 7. Science continues to decline, which is troubling because the Science ISAT questions did not change for common core. Yet Prospect had double the amount of meets and exceeds than the other schools. We need to determine why and perform that type of analysis when looking at the data." We want to piggy back onto # 1. With regard to the MAP testing, Ms. Garg suggested that rather than eliminate MAP testing (which seems to be under consideration), it would be best to discontinue the Winter MAP tests. We agree. Our students are suffering from test "overload," especially now that the new PARCC assessment will be given multiple times each year. The MAP tests are good indicators of individual student's performance and skill levels and we do not believe the test should be eliminated in its entirety. With regard to #6 above, it is a shame that no principals were in attendance to present their individual school's Improvement Plans or answer board member questions. Last year (as was pointed out by a community member during closing comment), they were present and the improvement plans were presented in early November. We believe that the building principals should have their improvement plans ready when school starts and the plans should be presented to the board at the first meeting in September. After all, the plans cover the new school year, and it is troubling that they are not presented until almost 1/2 of the school year has elapsed. Principals work during the summer months, as do the Central Office Administrators. It seems only logical that this is the type of work that should be started and completed during the summer when classes are not in session. Last year, the BOE approved 3 performance goals that it directed the administration to track and assess at the start of this school year. In addition to a report on the school Improvement plans, last night's meeting was the meeting at which the administration was scheduled to present the board with its formal report on the indicators tracked and measured to determine if the 3 goals were met. (2013-2014 Achievement and Goals Review Presentation.) It is a shame that a meeting of this importance was scheduled during a week that was guaranteed to have minimal attendance, since school was out of session for all students, many families were traveling and for those that stayed in town, the evening parent teacher conferences overlapped with the meeting. Worse yet, not all board members were in attendance. We will say more about that next week in our "Daily Reason #8 Why Marty Turek Should NOT be Re-elected to the D181 BOE." Better agenda planning is needed in order to ensure full participation by all board members and to encourage parents, community members, principals and teachers to attend a meeting of such importance. Finally, we too commend the professional, efficient and productive way Ms. Garg ran the meeting in Turek's absence. Perhaps we should all be thankful that he missed the meeting. It was an example of what the BOE will be like if he is not reelected. #7: Mr. Turek has violated the board agreement that all board members are to have the same information from the Superintendent. 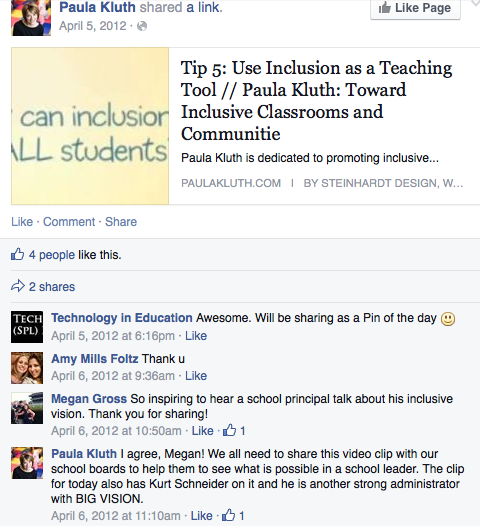 One example we discussed in an earlier post was that during the 8/26/13 board meeting, Turek acknowledged that he had known ahead of time that during the summer, 7 administrators had attended an all expense paid trip to a Social Justice Institute in Milwaukee at which Dr. Schneider was a presenter, and which at least one board member asserted could have been given internally, saving the district and D181 taxpayers thousands of dollars. 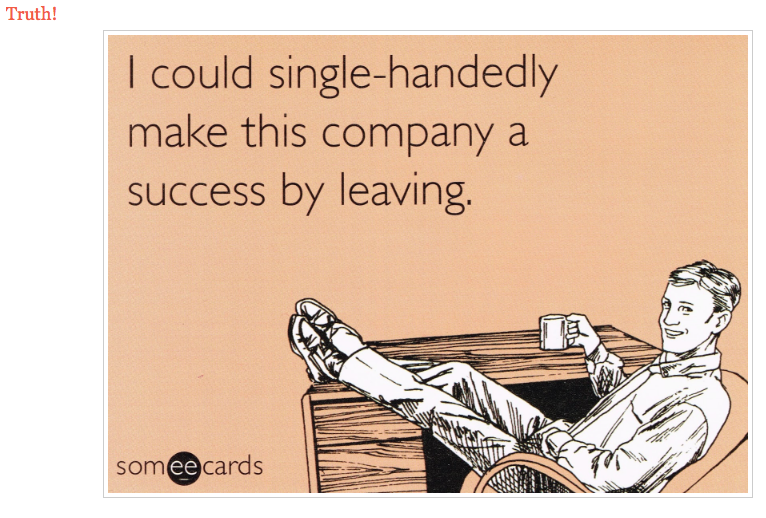 (See: Meeting minutes.) In spite of the board agreement that the seven board members agreed to follow, Turek did not share the information he received from Dr. Schuster. By not correcting Dr. Schuster's violation of not providing all board members the same information, Turek also violated the agreement and showed a lack of respect towards his fellow board members. #6: As we reported in an earlier post, we are concerned that Mr. Turek does not adequately prepare for meetings or spend the necessary time reviewing and reflecting on board materials in order to be able to participate in a meaningful way. During the 9/9/13 meeting, Turek, referring to his review of the annual ISAT data presentation included in the Board docs for that meeting, stated “I hope my boss isn’t listening because I read it today at work.” His “admission” was greeted with laughter by some of his fellow board members and administrators. Board members receive their meeting materials via Board Docs at least the weekend before a Monday meeting so they have time to review and prepare. We know from past board discussions that members are urged to submit questions they have to the superintendent by Monday morning. How reflective can Turek be, especially in his role as the board president, when he waits until the day of a meeting to review board materials, and then does so while he is supposed to be working? The community should elect members who are willing to adequately prepare for meetings, not do so at the last minute and not shirk their other responsibilities in the process. #5: In our opinion, Mr. Turek showed a lack of fiduciary duty and disregard of D181 taxpayers, when he voted (on 5/29/14) to approve multi-year contracts for 6 administrators that had effective dates of 5/30/14 (during the 2013-2014 school year). See 6/4/14 Post. As we explained in that post, the beginning date of the multi-year contracts was May 30, 2014, just one day after they were approved and overlapped with those administrators' 2013-2014 contracts approved on 3/18/13. Benaitis, for example, was given a multi-year contract that had a term of 3 years and 1 month, with an end date of 6/30/17. Click to open 5/29/14 agenda item with links to each contract. In our opinion, by approving multi-year contracts that overlapped with existing contracts, Mr. Turek (and the BOE majority) circumvented the intent of the Illinois Pension Reform Act for existing staff, negatively Impacting D181 taxpayers. How? Under the Illinois pension reform act, pensionable salary is capped at $110,000 OR the highest salary specified at the end of an administrator's contract in effect on May 31, 2014. By starting the new multi-year contracts prior to 5/31, the administrators' pensionable salary will be based on the highest salary specified in the last year of each of their contracts. By entering into multi-year contracts with a start date of 5/30/14, rather than 7/1/14, the administrators avoided having their pensionable salaries be their lower 2013-2014 salaries, as would otherwise have been required under the pension reform law. Instead, their pensions will be based upon their highest salary contracted during the term of the contract. This will directly impact D181 and all Illinois taxpayers whose taxpayer dollars fund the pensions. This will cost everyone more money to fund the existing administrators' pensions in direct contravention of the intent of Illinois legislators whose intent was to "stop the bleeding" by capping pensionable salaries. Is this really what our taxpayers want? 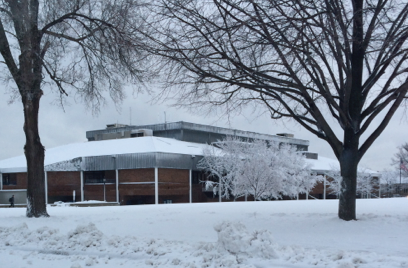 Blizzard Arrives Early With Superintendent White's Report for BOE Meeting on Monday, 11/24 -- Elm School, 7 p.m.
1. Why is a School Improvement Plan (Link 2) (Apparently developed by Schneider) being presented late in November, just before the Thanksgiving Break when students have a week off, many parents are traveling and not engaged? Shouldn't this plan have (with, in our opinion, questionable numbers and fudge factors) been presented at the START of the school year? Instead of preparing for a TASH conference or his annual summer trek to Wisconsin to promote his inclusive philosophy, he should have been working on this plan and had it ready to go in early August. Heckuva job, Dr. Schneider. 2. We were dizzy and disoriented after reading through the 70 plus slides (Link 1) in Dr. White's student performance presentation. A simple question: where is the actual analysis and what does it mean for our students? We continue to be unimpressed with student performance and now we have MULTIPLE POINTS of DATA to consider. What are you doing, Dr. White? 3. Conveniently buried at the end of the side, er, slideshow, there is a question as to whether MAP is the best test to continue using. (See Slide 71 of Link 1.) Once again, we see the seeds of doubt being planted. Parents, this is the one test our children take that actually shows growth and teaching effectiveness. Why does the White-Schneider tag team want to get rid of it? Too much evidence that their Learning for All mandate is failing our students and not creating the growth we should be seeing? #4: During his tenure on the BOE, Mr. Turek approved Dawn Benaitis' promotion from principal of Monroe School to Director of Curriculum, Assessment and Instruction in the Department of Learning. He also approved her raises. As we previously reported, in less than three years (from 2012-2013 to the 2014-2015 school year), Benaitis' base salary increased 18.8% from $109,660 to $130,250. Further, despite community concerns regarding Ms. Benaitis, on May 29, 2014, Turek voted to approve a multi-year contract for her. (Sources: 3/18/13 Consent Agenda, 5/6/13 Consent Agenda, 3/24/14 Personnel consent agenda, Benaitis Multi-year contract) In our 6/4/14 Post we raised serious concerns about the multi-year contracts, including Benaitis', that Turek voted to approve on 5/29/14. More on that tomorrow......Until then, in our opinion, Mr. Turek's votes to approve outrageous raises and promotions for Benaitis are further examples of poor leadership decisions that establish Turek's inability to act in the best interests of D181's students. #3: Mr. Turek failed to oppose Dr. White's promotion of Kurt Schneider into the position of SOLE Assistant Superintendent of Learning, on July 8, 2014 (or at any meeting since then). (Link to 7/8/14 Superintendent's report.) 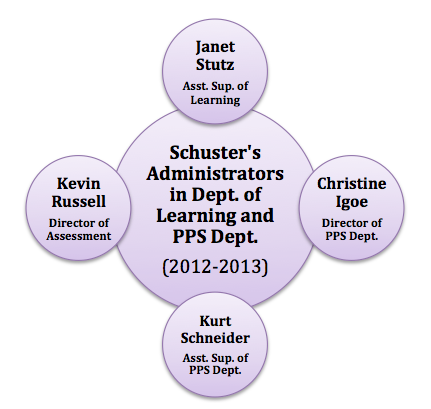 Schneider is now responsible for both the curriculum and special education departments. In our opinion, D181's curriculum chaos is the direct result of the lack of true leadership in the Department of Learning and Mr. Turek's support of poor leadership decisions evidences his inability to act in the best interests of D181's students. We would be remiss in failing to point out that one reason Mr. Turek failed to publicly oppose Dr. White's critical organizational change in the Learning Department was because he did not even attend the 7/8/14 board meeting, the only board meeting scheduled last July. "I provided the Board of Education two comprehensive achievement reports at the October 16, 2013 Board of Education meeting. These reports provide information about how our students have achieved on the NWEA Measure of Academic Progress (MAP) and Illinois Standards Assessment Tests (ISATs) which were administered during the 2012-2013 school year. These comprehensive reports can be viewed by clicking on the following links:"
This is significant because at the 11/7/14 Board meeting, he suggested that it was too time consuming for the D181 Department of Learning administrators to generate such performance data analysis reports. (See 11/13/14 Blog Post.) At that same meeting, Dr. White also went on record as stating that he believes he should spend part of his time generating student assessment data analysis reports, along with running and managing our district of 4,000+ students, many teachers and staff. Since D181 does not have an administrator who is experienced in assessment, it will be up to Dr. White to develop reports on student progress. After all, Kurt Schneider, Assistant Superintendent of Everything Under the Sun, is far too busy with scheduling professional development for our teachers related to differentiation (for the bazillionth time), and promoting his pipe dream of one-size-fits-all-fully-inclusive-happy-happy-joy-joy-joyful-learning classrooms with the expense of his cadre of consultants. Ah, yes; such efforts take tremendous time and district resources in the name of taxpayer dollars. But, alas, such is a topic for another post. Embedded within the report is the claim that MAP is just one data point, which is a meme White and Kurt Schneider constantly talk up to the board and to parents. Riiiiiiiiiiiight. So the fact that only a few grades showed minimal growth and most showed stagnant or negative is nothing to be alarmed about? Apparently not within this administration. More importantly, White has taken it upon himself to allow a fudge factor of the Standard Error of Measurement when interpreting the MAP results (http://www.boarddocs.com/il/hccsdil/Board.nsf/files/9PMULP7C97DA/$file/D181_MAP_Standard_Error_%26_Standard_Deviation-2_10_6_14.pdf) which is NOT a common practice. Student growth should be reported for what it is, as is the case in the Troy report (2012-2013 NWEA MAP Assessment Report ). Seems like White is following in Schuster's footsteps of selective data interpretation. #2: As the board president for the last 2 years, Mr. Turek's job has been to preside over the board meetings, however, his actual authority during said meetings is no greater than the other six board members. (Board Policy 2:110.) Rather than facilitate discussions during the meetings, listen to and take his fellow board members' opinions on issues into consideration, he has attacked them and tried to shut them down. Case in point, suggesting during the 12/9/13 board meeting that well respected Board Member Brendan Heneghan was going down a "rat hole" when he suggested there should be a curriculum committee similar to the finance committee. Less than one year later, a curriculum committee called the Learning Committee has been formed. We guess Mr. Turek got it wrong when he called Mr. Heneghan out. Daily reason #1: Four years ago the Hinsdale Caucus got it right when they did not endorse Mr. Turek. Today the Hinsdale D181 Caucus Committee released the names of the four BOE candidates it will present for endorsement on December 3 to all of the Hinsdale Caucus delegates (Source: 11/18/14 Hinsdale Doings article). We were utterly disgusted that they have chosen to endorse current BOE member and president Marty Turek. We cannot fathom how in light of Mr. Turek's behavior on the school board in the last 3 1/2 years, that any group of informed citizens could have possibly concluded that he deserves a second term and will be a better candidate than any other applicant. Our conclusion is that the D181 Caucus Committee was not well informed and did not perform it's due diligence on Mr. Turek prior to selecting him. So tonight, we are launching a new series intended to educate and inform our readers, old and hopefully new, of our "Daily Reason" why Mr. Turek should NOT be reelected. * Feel free to send us any reasons you would like to see added to the list. * The Hinsdale D181 Caucus Committee also selected 3 additional candidates: Jennifer Burns, Leslie Gray and Richard Giltner. It would be premature for us to opine on these three caucus endorsed individuals without first conducting our own due diligence on their qualifications. In addition, additional candidates may choose to run for election. We certainly hope there will be at least one more candidate, so that Mr. Turek will not just waltz back into his board seat without a real contest. Our community deserves to listen to at least one public debate with all of the candidates during which they will have to present their positions on critical issues facing the district. Once all the candidates have emerged, and we have completed our due diligence, no doubt we will endorse one or more of them prior to the election. Wick's Words on D86 Proposed Tax Levy and Our "D181 Reflections"
Today we received the following comment from Mr. Wick regarding the proposed High School District Tax Levy that will be discussed tonight at the D86 BOE meeting. With the threat of Senate Bill 16 looming, and the possible loss of millions of dollars in state funding, the upcoming tax levy votes at both District 181 and the high school district our schools feed into, D86, are critical to their long term financial well-being. Our communities cannot ignore the possible long term, negative impact on our districts' budgets should Senate Bill 16 pass AND should either district under-levy the full amount the Tax Cap Law allows districts to assess without going to referendum. We appreciate Mr. Wick's comment and urge you all to read it, after which we have added our "D181 Reflections." "I don't know how many folks that follow this blog also care about the operation of our associated high school, D86, but anyone that understands what really precipitated the ugliness earlier this fall should be aware there are still extremists running that BOE. There is a crucial BOE meeting TONIGHT, Monday November 17, 7:00PM in the Cafeteria of Hinsdale Central High School, 5500 S Grant Street. The levy for the upcoming year will be voted on. The district 86 new CFO has prepared a detailed yet understandable overview of the entire tax picture. In that presentation it is abundantly clear using projection based on the negotiated contract, a very modest increase of 1.5% in 'purchased services' and ZERO growth in either supplies or capital expenses the MINIMUM levy should be increased by 1.86% Levy Info D86 |Bill Eagan CFO See page 17. Save our Schools -- Give radicals on the BOE a Gift Card! I have been involved in watching local governmental bodies try to make decisions about setting a fair levy for decades and this is one the clearest presentations I have ever come across. The illustrations of how changes in assessment and the impact of TIF districts can result in temporarily elevated burden for individual home owners followed by potential reclamation of revenue is clearly shown. I highly recommend folks review this info. PARENTS: MAYBE A SEPARATE POSTING IS WARRANTED?" Now that you have read Mr. Wick's comment, we wanted to add our D181 reflections. We agree that the D86 CFO prepared an outstanding presentation on the tax levy proposals and explained the terminology, formulas used and sources of property tax dollars (new vs. existing construction). After reviewing this proposal and comparing it to the one presented last week at the November 10th D181 board meeting, (D181 Tax Levy Proposal), it should be clear to all our readers that if the D181 approves its proposed tax levy, it will be leaving $538,678 in new construction money on the table. Slide 11 of the D86 presentation explains the importance of new construction money and why it was included in the Tax Cap formula. 1. Why didn't the administration explain clearly to the D181 BOE at the 11/10/14 board meeting that the proposed levy will leave $538,678 in new construction money on the table? 2. Why didn't the administration provide more than one scenario for the D181 BOE's consideration, including one in which the new construction money would be levied to the maximum amount allowed? 3. Why didn't the administration provide long term projections for the D181 BOE's consideration that showed the impact on the budget over the next four years should the board under-levy AND should Senate Bill 16 be approved, stripping D181 of $1.65 million dollars in state funding? The combination of both actions would strip the district budget of nearly $2.2 million each year going forward! 4. Why didn't Board President Turek raise these questions and ask the administration to answer them? Doesn't he understand the tax cap law? Doesn't he understand the long term effect of under-levying? Doesn't he understand the long term negative impact on D181 should Senate Bill 16 be approved? Or is Mr. Turek simply trying to get in the good graces of the Citizens for Clarendon Hills PAC that supported Mr. Corcoran, Mr. Cassini and Ms. Manley in the last D86 election -- a group that is anti-tax and has pushed for and supported the D86 board majority's efforts to under-levy? Remember, last year, the D86 BOE approved a flat -- zero percent increase-- levy. Last year, Mr. Corcoran, a member of the Citizens for Clarendon Hills PAC, and a second member of that group, both attended the December 9, 2013 BOE meeting at which the BOE approved this year's tax levy. Both gentlemen advocated for the D181 BOE to approve a flat levy. (Source: http://podcast.d181.org/?p=214 D181 12/9/13 Podcast -- comments begin at 15:22.) The D181 BOE failed to pass a flat levy last year. Is Mr. Turek now supporting an under-levy by D181 for next year in order to ensure the Citizens for Clarendon Hills PAC's support and votes should he decide to run for re-election next Spring? There is still one more D181 board meeting scheduled before the 12/8 meeting at which the board will vote on the tax levy. The next meeting will be held on Monday, November 24 at 7 p.m. at Elm School. Hopefully one or more board members will insist that Mr. Turek put the proposed levy back on the agenda for further clarification and board discussion. Our students' future educational programs, class sizes and capital improvements may all be jeopardized if the BOE under-levies and Senate Bill 16 is approved. If Mr. Turek is unwilling to be fully transparent about the impact of what he is about to approve, another board member needs to demand full disclosure and discussion of this important issue. Let It Snow, Let It Snow, Let it Snow. The November 10th Board Meeting was a White-out! Monday night's board meeting was a "White-out." We are extremely disappointed with Dr. White and the majority of the apathetic board members (Turek, Yaeger, Clarin) who allowed White's administrators to effectively dodge important questions while "snowing" the board and community with a blizzard of distractions. (Nelson was absent, again.) We encourage you to listen to the podcast of the November 10th meeting which is available on the district website (link to 11/10 podcast). We also urge you to review the meeting agenda (link to agenda) and questions board members submitted to Dr White prior to the meeting (link to questions). What wasn't on the agenda for the meeting? No discussion of ISAT scores or state rankings. Following the release of the Illinois State Report Cards and State Rankings that showed most of our schools dropped in the rankings, we expected Dr. White to present a formal report and lead a board discussion on the scores and rankings. We expected him to explain why -- in the face of the harder test and new cut scores used by ISAT -- 6 out of 9 of our schools dropped in the rankings relative to other districts that showed improvement. While Dr. White did provide the basic ranking information that aleady appeared in local newspapers, he did so only after Board member Garg's pre-meeting request. However, during the meeting, there was no substantive discussion on the implications, if any, of the school rankings, or how they compared to last year. Unlike last year's phony "celebration" of the 2013 dismal ISAT state rankings by Dr. Schuster (Click to open link post), Dr. White has apparently chosen to play a game of "avoid" the elephant in the room -- if data stinks, the board should hear nothing about it. There should have been a complete comparative analysis done between last year's scores and this year's scores. There should have been an explanation of why some previously lower ranked districts shot up in the rankings, while most of our schools dropped. The board should have demanded answers to these questions and asked what steps would be taken next year to improve the scores and rankings. None of this happened! Schneider: "In general our students are growing, students continue to make growth. You can have different conclusions depending on what type of data your are looking at. I think people need to be mindful of that. What we want to see is no matter what data you're looking at, that data gets into the buildings so the leadership teams at each school get a look at it." Benaitis: "That one test, one score on one given day, is a snapshot. We want to make sure we are looking at a photo album. This is one piece out of the whole picture, and I think it is really important that you look at multiple measures to get an accurate picture and make any conclusion." 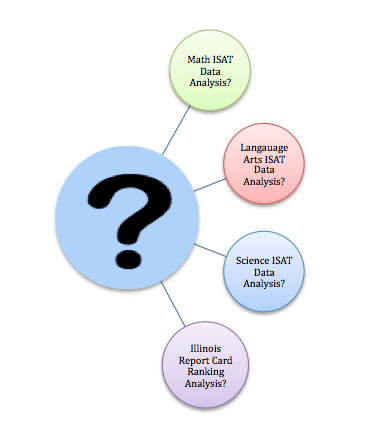 We agree that the ISAT tests are just one data point. The problem is that no one in the administration is taking the time to conduct an analysis of the multiple data points D181 has amassed over the last three years of the multiple tests our students have taken. Why not? In our opinion, it is because no one in the administration has the skill set, experience or qualifications to conduct such an analysis, report on it, formulate and implement a plan on how to improve the declining performance. Dr. White and Dr. Schneider, we don't want to know what the data shows "in general." We want the BOE to be presented with a detailed analysis of all of the data points the administration has been (or should have been) gathering over the last three years. We want the BOE to start making data-driven decisions, rather than simply buying into the bluster spewing out of the administrators' mouths. The agenda did not include an update on the Math Pilots. With the discontinuation in three schools of the Agile Minds and Investigations math pilot programs after last month's board meeting, and their transition back to last year's math programs, we expected the agenda to include a formal report on how the transition was going. After all, nearly 100 parents attended the last board meeting and justifiably complained about Agile Minds and Investigations, demanding their discontinuation and pleading with the administration to fix the mess. Did Dr. White not realize that a follow up report and presentation to the BOE would be the appropriate course to follow? Nope. Instead, it wasn't until Board member Garg asked him to provide an update, that he punted the question to Dr. Schneider and two principals, apologizing to them for putting them on the spot with the unexpected question. Unexpected? If anything, he should have foreseen it! Principal Pena was able to give an update on what the teachers at HMS have been doing to identify any gaps in the Agile Minds curriculum and the one they are using now. But then Dr. White asked Dr. Schneider for an update on the elementary schools. Dr. Schneider blundered his answer-- giving a non-substantive response about the two impacted elementary schools. Thankfully, Principal McMahon was present to give a more detailed update. We have listened to this portion of the meeting several times now and are utterly disgusted that neither the Superintendent or the Assistant Superintendent of Curriculum were able to provide a basic update without reliance on the principals. Isn't the central administration in charge of the curriculum decisions? Isn't the central administration supposed to oversee the implementation of the math pilots and any changes to the curriculum? It is becoming clearer with each passing day that there is ZERO curriculum expertise in the central administration. How can the BOE allow this to continue? Nothing on the agenda addressing the impact of the proposed levy to Senate Bill 16. While the agenda included a presentation to the board of the proposed 2015 Tax Levy the board will be asked to approve on December 8, the presentation was lacking in any detail that would have exposed it for what it was: a proposal to under-levy next year, leaving on the table over $500,000 of new construction tax money that could be collected under the Illinois Tax Cap Law. Read the materials posted on board docs very carefully and then go back and listen to the podcast of the board discussion. (Tax Levy presentation.) The discussion was very short. Not a single question was asked about why the board would under-levy in light of the possible future legislative approval of Senate Bill 16 that may strip D181 of over $1.65 million in state funding. There were no questions or discussion on the compounding impact of under-levying $500,000 of new construction money, nor the possible negative impact of Senate Bill 16 on D181's educational programs and teachers. There were no questions on why money should be under-levied at a time when the Facilities Committee is exploring building options that might require a tax referendum. Why weren't any of these questions asked or discussed? In light of the very detailed discussions and debates ensuing in District 86, as well as that board's request for multiple proposals and scenarios laying out the impact of possible tax levies, it is disturbing that the D181 board is not conducting more detailed, serious discussions on the tax levy. Isn't President Turek responsible for setting the meeting agendas with Dr. White? Isn't he following what our neighboring high school district is doing? Isn't he aware that the D86 finance manager is asking for the maximum levy to be approved this year -- including the maximum a district can tax on new construction? The continued reference by certain board members, such as Gary Clarin, to the work being done by the D181 Finance Committee is a red herring and inappropriate. The Finance Committee only has 2 board members on it. It is a superintendent's committee. It has no taxing authority. It doesn't even present written or verbal reports to the BOE on what it is doing. The only entity with taxing authority is the BOE. That is the entity that should be conducting a detailed discussion before it votes on anything. Board President Turek is shirking his duties and obligations as one of seven elected official tasked with overseeing our district finances and ensuring the meeting agendas cover topics the full board should be discussing in detail. And he wants to run for reelection? Late last night, we received a series of comments from one of our readers, Jay Wick, regarding the Board Meeting held at Madison School. To use his words, he "buried" his comments in a post we published in July 2013. We have decided to "unbury" Mr. Wick's comments and publish them as a free standing post, after receiving several requests to do so from other readers. He has written regularly to the blog and while we have not always agreed with his comments, they are thoughtful and provide food for thought. His comments raise some very important points, most which probably will not be understood by some of the D181 board members, Turek in particular, who may be running for re-election next Spring. The title is ours, the words are his. As always, we welcome your comments and the time you take in writing them. "I thought it might be fun to "bury" a little summary of tonight's BOE back among those posts from when page view of this blog were literally 1/100th of what they are today. The reason I doing so is two fold: firstly to remind people that try to dismiss the effectiveness of this medium that there is in fact quite a bit of interest in how our district is run, AND point out the fact that too often the relatively empty / quite meeting of the BOE do not mean that "all is well". Tonight was the legally important date for the district to make their first effort at a levy. The business manager laid out a mostly clear picture of the process (something that arguably is not necessary, as at this point in time all the BOE members have been through at least one full cycle of such budgetary information...). The BOE's titular head extended a very "Heckuva job, Brownie" type thanks and there was not a whole lot of dissent or questioning. That is troubling on several levels -- Firstly there are those that would like to see the whole of the budgeting process laid out on a "zero based budget". They would not be happy to just see everything rolled over from last year. Secondly there are those of us that recognize that under Illinois system of CAPPED PROPERTY TAX any budget that does not address the actual percentage increases for important categories like salaries (which constitute about 85% of the district's expenditures) have a high probability of seriously short-changing all the other important areas that the district funds should be spent on. The sad fact is that there were NO other parents or community members that questioned anything! Honestly I would have been happier to see some honest-to-goodness tax slasher type out in the open rather than find out too late that they managed to sneak past those should have exposed such scoundrel in the vetting process. Let me reiterate where I stand on a few things. I've talked to enough community members who understand taxes to be one of those things that you have to be savvy about it -- a valuable home will likely carry a hefty bill. Uncle Sam helps you out quite a bit by allowing those property taxes to reduce one's income tax liability to a considerable degree, but it still ain't a free ride. My elderly mom well knows this, as do my many retired neighbors that choose to remain in their homes and "age in place". I certainly know it too. Folks that are dishonest or hypocritical about such things will find me tearing their baseless arguments to shreds. That said, those of us who have devoted considerable time to truly understanding how taxes work in this state are often most acutely aware of when the public is NOT getting good value for their expenditures. When we've had the opportunity to convince government units to find cost savings we have done so vociferously. THAT remains a primary reason why I devote time to this! I have no doubt that I may often come across as overly sure of my own conclusions. I don't know to really respond to this other than show that in nearly every "controversial topic" that I have attacked the BOE for I have shown that there is legitimate disagreement among the whole of the eductional community. The honest researchers that analyze studies about anything like classroom size or pedagogical approached to reading or math generally go out of their way to present their data and allow other access to every aspect of the study. The best will come right out and say things like the data that disproved their hypothesis forced to reevaluate previous approaches or design more thorough test to understand the discrepancy. I try to show the same kind of approach, it is not just for sake of "balance" but because I really believe there is a great deal of uncertainty in what is truly "best" for any child. I similarly would expect our district staff to try to convey some of these "shades of grey" when they offer recommendations for the district. Joyful Learning? Are You Kidding? -- Part 2: D181 Parents, Don't Let Yourselves be "Whitewashed." 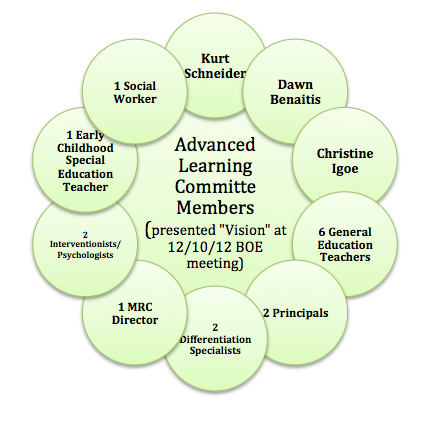 After all the connections between Dr. Schneider and other social justice and inclusive classroom advocates we identified in our 11/1/14 post "Bubblemania," we bloggers thought we would do a little investigating into Dr. Kluth's association with D181 and her previous professional contacts. Sure enough, she is a colleague of Kurt Schneider's and has worked in D181 in the past couple of years doing professional development for teachers while embarking on Schneider's crusade for full inclusion within all of our classrooms. 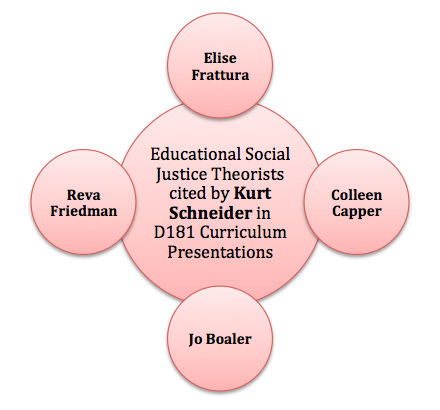 Both Schneider and Dr. Kluth have been presenters at the same social justice institutes and inclusion conferences. 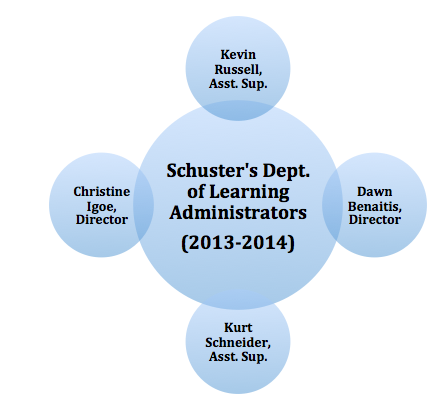 The links we provide throughout this post establish Dr. Kluth's connections to Schneider, and clearly show that he has a professional relationship with her that began before he was hired by D181 and extends beyond our district. In fact, we believe we have found a smoking gun link that, in our opinion, establishes unequivocally that it was Schneider who introduced D181 to the social justice and inclusion ideologies that underlie the Learning for All Plan. In our opinion, any suggestion by Dr. White or Schneider, that the Advanced Learning Plan/aka Learning for All Plan/aka Joyful Learning was Dr. Schuster's brainchild and that Dr. Schneider was simply following her orders, does not withstand scrutiny. "We all need to share this video clip with our school boards to help them to see what is possible in a school leader. The clip for today also has Kurt Schneider on it and he is another strong administrator with BIG VISION." Today we begin a new series called "Joyful Learning? Are You Kidding?" This series will cover some additional information that Dr. White has shared with us about upcoming events. As we prepare Part 2, we begin with Part 1: "A Teaser." The video speaks for itself. Please watch it to the end. We believe it will set the mood for our next post. This morning we received the following comment and then a second one asking us to publish it as a free standing post. We have obliged because we are outraged by Dr. White's suggestion in his Superintendent's Report for Monday's BOE meeting (11/10/14 at Madison School - 7 pm) that Late Starts be reconsidered for D181. Click link to open Dr. White's Report. More to follow later on other issues we have flagged in Dr. White's report. Hey: note to White and Schneider: late start/ early release is one of this community's non negotiables!!! How dare you bring it up in your boe report. There was a petition signed by a 1000 parents and a survey - the answer was a resounding no. But I guess neither of you care about parents or the fact that we just "resolved " this with the teacher contract. Simple solution: get rid of learning for all! Problem solved! And no substitute teacher shortgage to boot. It shouldn't be this hard. Also data is not an after thought. Your boe meeting agenda is pathetic! No isat analysis, no 5essential survey ( Monroe Madison teachers were scathing), no math plan, no school improvement plan, no science isats. White: I no longer support you. You have let us down. You and Schneider can leave together. And take Benaitis with you. Where is the ISAT report, Dr White? How about a breakdown of data? We find it appalling that there is no mention of an ISAT report on the upcoming agenda for the next board meeting at Madison School, on Monday, November 10 at 7pm. District test results are not acceptable. Learning for All is not working. Dr White, Dr Schneider: What are you doing about it? What do the following 12 bubble charts all have in common? Burst that bubble and maybe D181 will stand a chance of righting its sinking curriculum ship.